An Admissions Assistant assesses the admission application, scrutinizes it, selects and rejects the admission files based on related criteria. It is also the responsibility of the Admissions Assistant to ensure that they provide the fullest support to the prospective students. 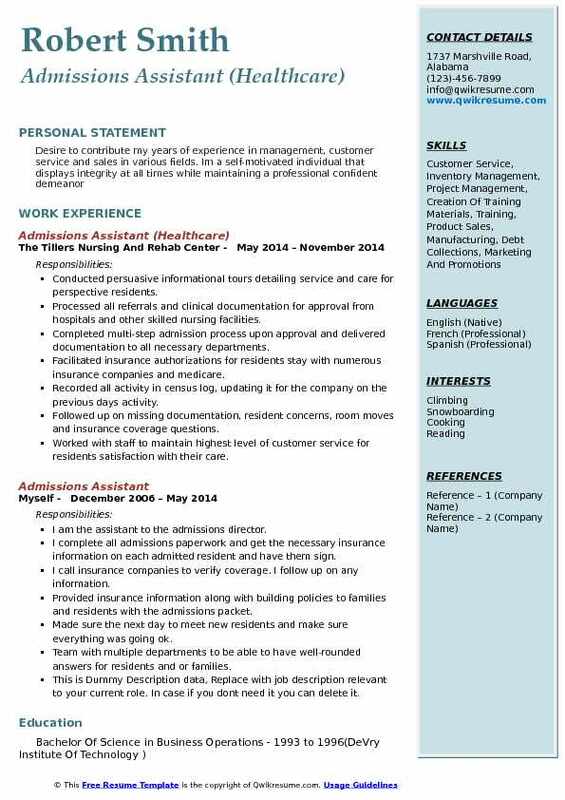 The job duties prescribed in the Admissions Assistant Resume sample include – receiving and making calls, replying to inquiries, maintaining the database of every admission/student, organizing reception desk, carrying out data entry work, greeting and replying visitors’ queries, attending campus events and updating the management. The Admissions Assistant should possess skills such as customer service, detail orientation, knowledge of admission process, patience, approachable manner, computer knowledge and have a pleasing attitude. Normally there is no specific educational qualification that is mandatory for getting into this line, yet Educational institutions prefer to hand over this responsible post to those candidates who possess a Bachelor’s degree in any field. Headline : Provide administrative support using good judgment, professionalism, along with a strong attention to detail and the ability to work independently. Possession of strong communication and interaction skills. Good work ethic. Processing nominations received from members of Congress. Reviewing and evaluating all applications received online and by mail. Serving as initial point-of-contact with students and parents visiting the academy and requesting an interview and/or tour. Providing visitors with applicable documents. Answering all incoming calls on toll-free telephone lines. Respond to student inquiries received via telephone, letter and/or e-mail. Serving as a liaison with congressional offices and frequently interacts with staff officers. Composing and transcribing letters, inter-office memoranda and inter-office reports including confidential materials. Conducting analysis of clerical and administrative procedures and candidate admissions support issues. Maintaining computer database files, i.e. Candidates database, congressional database, etc. Completing updates and changes to candidate data in a timely manner. Managing and maintaining candidates files throughout all phases of the application process, to include appointments, medical clearance, acceptance, and orders issuance; also maintaining files on those applicants who withdraw or are otherwise denied entrance. Summary : Experienced administration professional with proven track record of managing all aspects of school administration and admissions within a busy working environment, prominently based in private schools. 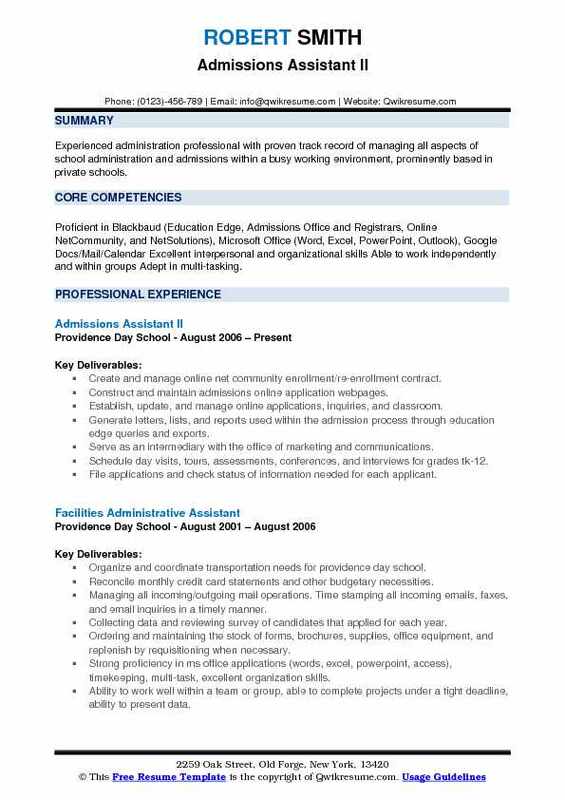 Skills : Proficient in Blackbaud (Education Edge, Admissions Office and Registrars, Online NetCommunity, and NetSolutions), Microsoft Office (Word, Excel, PowerPoint, Outlook), Google Docs/Mail/Calendar Excellent interpersonal and organizational skills Able to work independently and within groups Adept in multi-tasking. Create and manage online net community enrollment/re-enrollment contract. Construct and maintain admissions online application webpages. Establish, update, and manage online applications, inquiries, and classroom. Generate letters, lists, and reports used within the admission process through education edge queries and exports. Serve as an intermediary with the office of marketing and communications. Schedule day visits, tours, assessments, conferences, and interviews for grades tk-12. File applications and check status of information needed for each applicant. Open house event planning: preparing packets, name tags, tables, and registration, along with scheduling facilities/room reservations. Work closely with our admissions parents association volunteers by coordinating the "parent side" of the admissions experience. Summary : Seeking a position requiring excellent business management skills. Position should require a variety of tasks, including strong administrative skills, word processing, spreadsheet, and database program use. Pursued internet-generated inquiries received from prospective students by telemarketing to secure admissions visits. Monitored admissions telephone conversations to ensure standards compliance. Managed admissions inquiries for prospective students from u. S. Military and veterans. Piloted outreach program to U.S. Military installations along the eastern seaboard. Represented YTI at more than 10 military and state-run education and job fairs in five states. Facilitated admissions visits for active military, reserve and national guard units, veterans hospitals, state and local veterans groups, and state job and education placement agencies. Enrolled qualified students for admission to yti career institute, Lancaster campus. Communicated with prospective students and families, translating inquiries into campus visits. Conducted interviews and provided campus tours for prospective students. Assisted students in the completion of enrollment documentation and requirements prior to starting classes. 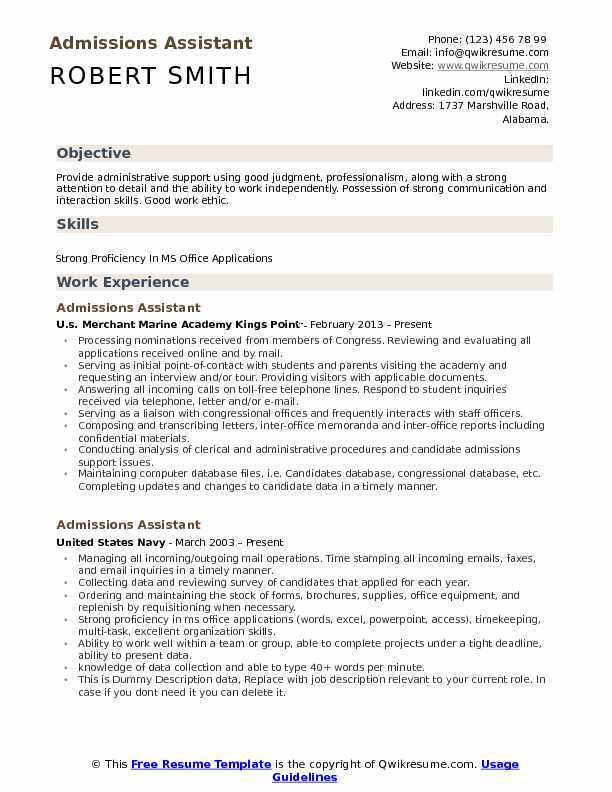 Headline : A hardworking and trustworthy individual with over 10 years experience as an Admissions assistant. Manage records and maintain confidentiality, detail oriented with excellent interpersonal skills. Provide excellent customer service to prospective students, families, and professors by means of information calls, emails, and customer interactions. Schedule individual visits for prospective students - collaborate with other departments to schedule meetings with professors, financial aid, and learning. Serve on the visit committee to grow student enrollment by optimizing student visits. Demonstrate the ability to work in a multifunctional environment by updating Web-based forms, communications and building events in tech solutions slate. Assist the event coordinator: check-in, tour follower, set-up and other duties as assigned. Implemented the admitted student visit program, which allows prospective students to experience butler by interacting with professors and current students. Implemented the colleges communication plan for prospective students utilizing customer relations management (crm) software. Conducted persuasive informational tours detailing service and care for perspective residents. Processed all referrals and clinical documentation for approval from hospitals and other skilled nursing facilities. Completed multi-step admission process upon approval and delivered documentation to all necessary departments. Facilitated insurance authorizations for residents stay with numerous insurance companies and medicare. Recorded all activity in census log, updating it for the company on the previous days activity. Followed up on missing documentation, resident concerns, room moves and insurance coverage questions. Worked with staff to maintain highest level of customer service for residents satisfaction with their care. Successfully toured, processed and admitted residents for a variety of care needs. Effectively processed a multitude of referral packets through admittance to facility on a daily basis. 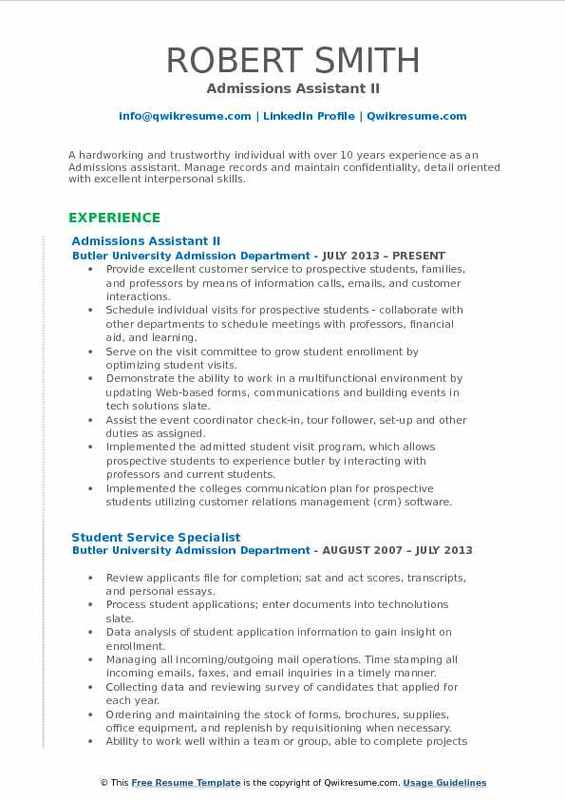 Objective : I am highly organized and very efficient Admissions Assistant with excellent knowledge related to admissions. I strive to keep any office running smoothly and will keep it at its maintained best. I am an individual who learns new tasks quickly and does well in fast-paced environments where professional customer service is necessary. 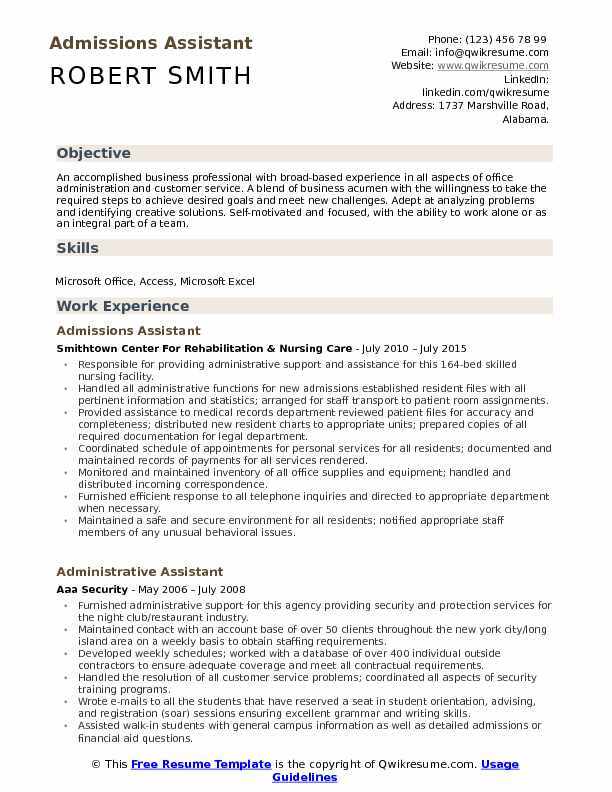 Provided additional support coverage for the receptionist, mailroom coordinator, and enrollment processors based on my 10+ years experience and defined knowledge of all aspects of each support staff role. Entrusted to work closely with senior director of admissions on all tasks, including those which were of confidential nature. Maintained daily reports, keeping them accurate and up to date so the senior director of admissions would be well aware of how close to plan the team was at any time. Created and managed schedules and meetings for the admissions office staff. Helped schedule and run monthly and annual events to help build awareness of our campus and also drive applications. Events included (but not limited to): open house, college connection, orientation, summer studio, college information session, DJ battle, get your game on-gaming event, Austin fashion week, honors reception, teacher workshop, guidance counselor event, movie screening, etc. Worked with various other departments of the college as the admissions liaison – ensuring non-admissions tasks and meetings are upheld for admissions employees. Social media optimization expert – updated the company facebook page and twitter account on a regular basis. Ten-year award for ten years of service with the art institutes (awarded September 2016). Faculty & staff leadership recognition: summer 2013 (awarded September 2017). Summary : Dedicated in customer service to maintain customer satisfaction, long term relationships and contribution to company success. Proven ability to establish rapport with clients and to exceed quotas. Reliable and driven, with strong time management and prioritization abilities. Listened to student needs, wants and desires; to find out exactly what they want and evaluate whether the college could provide what the students are looking for. Helped counsel them on different skills, strengths, weaknesses, and careers, that would best fit their aspirations. Demonstrated verbally; how a visit to the school campus would benefit them. 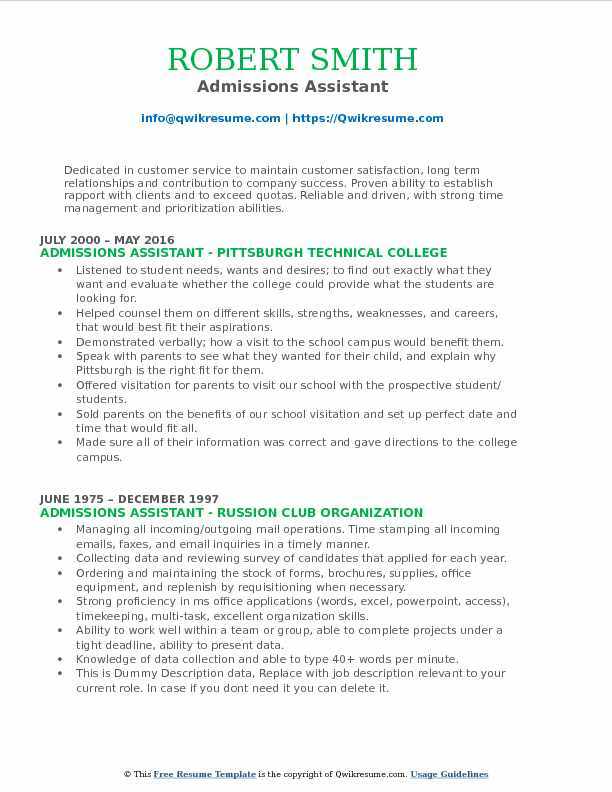 Speak with parents to see what they wanted for their child, and explain why Pittsburgh is the right fit for them. Offered visitation for parents to visit our school with the prospective student/ students. Sold parents on the benefits of our school visitation and set up perfect date and time that would fit all. Made sure all of their information was correct and gave directions to the college campus. 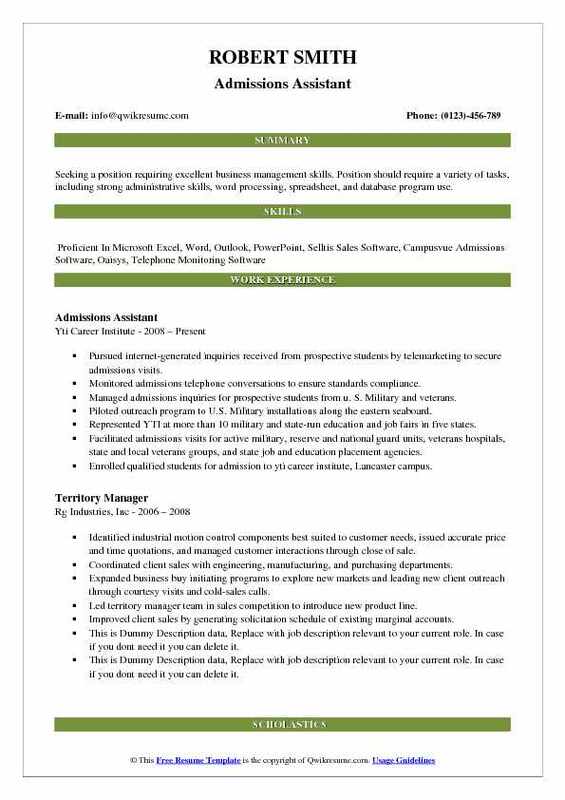 Summary : Twenty plus years of combined customer service, administrative, academic, and human resource experience. A proven track record of professionalism, loyalty, educational attainment, and leadership skills. Exceptional interpersonal communication skills, exemplary time-management practices, organizational skills, exceptional critical thinking, and decision-making competencies. Process incoming electronic and paper applications. Input data into cams and scan and link materials into image now (if applicable). Process electronic transcripts. This includes updating information in cams (status and document tracking) and linking in image now to students account. Sort and open all incoming mail to the undergraduate admissions office. This includes opening, stamping and sorting when appropriate. Scanning and linking all incoming documents into image now. This includes linking files to students accounts in cams and ensuring accuracy and data integrity. Assist with incoming phone calls, emails and walk-in students inquiring about admissions steps. Answer all email messages for the undergraduate admissions email account. Ensure data integrity by running admissions audit reports on a daily basis. This includes, but is not limited to, accuracy of application information, documents tracking and previous school information. Assist with online information sessions and other admissions events as needed. Provide campus tours for prospective students and families when necessary. Perform other duties which may be assigned by the assistant director and/or the director of admissions. Summary : Admissions Assistant professional with the ability to produce high-quality work and meet deadlines in a fast-paced, high volume environment successfully with a reputation for service, satisfaction, and results. Oversee general office operations within the office of admissions; to perform a wide variety of clerical and administrative tasks for the department, and to arrange and participate in special admissions functions. Organize and maintain various departmental files and records, frequently involving cross-filing/cross-reference systems using computer technology and other methods. 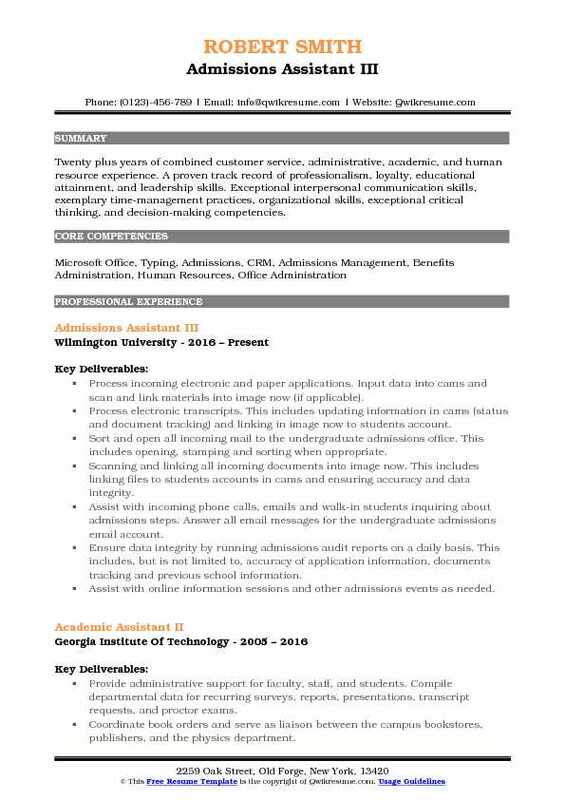 Coordinate, initiate, prepare, process, and/or monitor various financial/administrative/operations forms, records, reports, schedules, and other documents, ensuring timely and accurate completion of documents by other department/university personnel and/or outside individuals/organizations. Assist admissions administrators with planning and carrying out events, including university admissions projects, university fairs, and other such opportunities; attend events as needed and oversee assigned special events. Oversee preparation of student materials for the initial admissions decision, student admission documents, and the initial deposit process. Oversee a wide range of administrative functions within the admissions office to support routine operations and to manage special projects and events; represent the university at assigned events on campus and off campus as needed. Assist with general office support: answer phones and perform reception duties, prepare documents, order office supplies, maintain appointment calendars, photocopy, screen and distribute mail as needed. Serve as administrative liaison with students, faculty, staff, parents, alumni, vendors and/or another key department constituency: explain policies/procedures; answer various questions; coordinate services; handle special requests or problems. 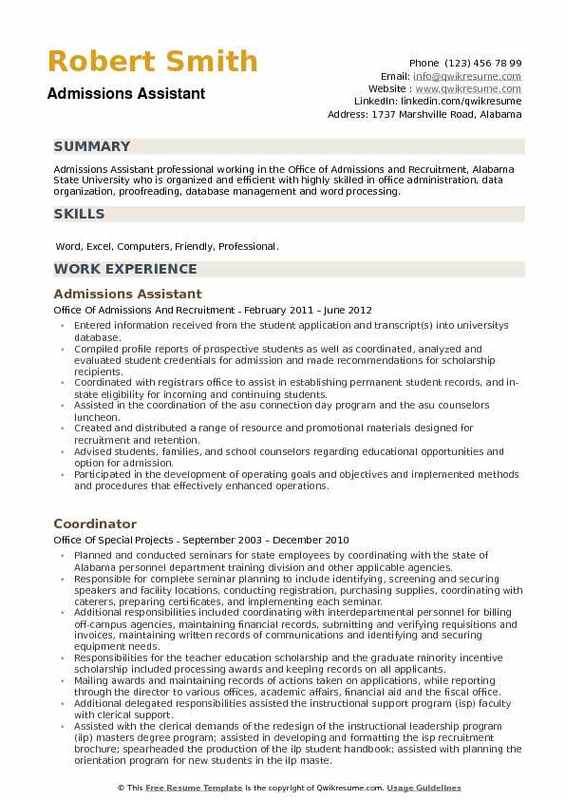 Objective : Admissions Assistant professional working in the Office of Admissions and Recruitment, Alabama State University who is organized and efficient with highly skilled in office administration, data organization, proofreading, database management and word processing. 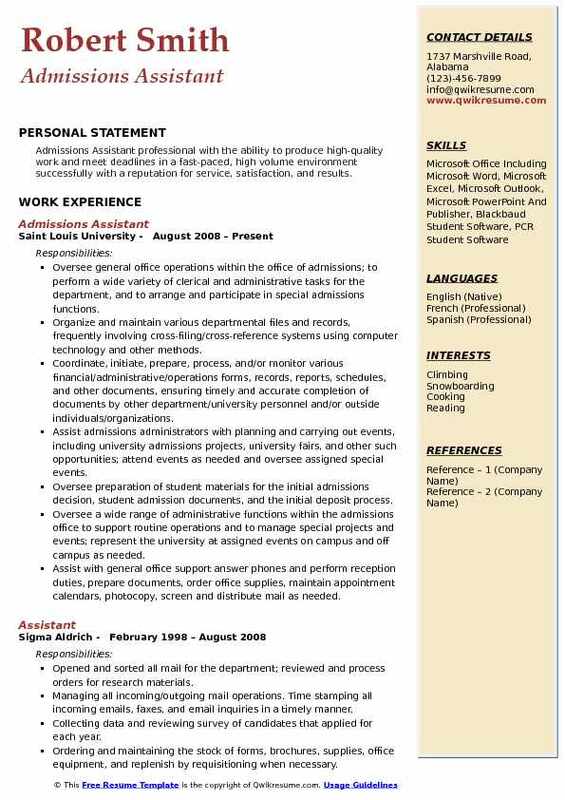 Skills : Word, Excel, Computers, Friendly, Professional. Entered information received from the student application and transcript(s) into universitys database. Compiled profile reports of prospective students as well as coordinated, analyzed and evaluated student credentials for admission and made recommendations for scholarship recipients. Coordinated with registrars office to assist in establishing permanent student records, and in-state eligibility for incoming and continuing students. Assisted in the coordination of the asu connection day program and the asu counselors luncheon. Created and distributed a range of resource and promotional materials designed for recruitment and retention. Advised students, families, and school counselors regarding educational opportunities and option for admission. Participated in the development of operating goals and objectives and implemented methods and procedures that effectively enhanced operations. Followed-up with students until admission status was granted. Performed miscellaneous job-related duties as assigned. 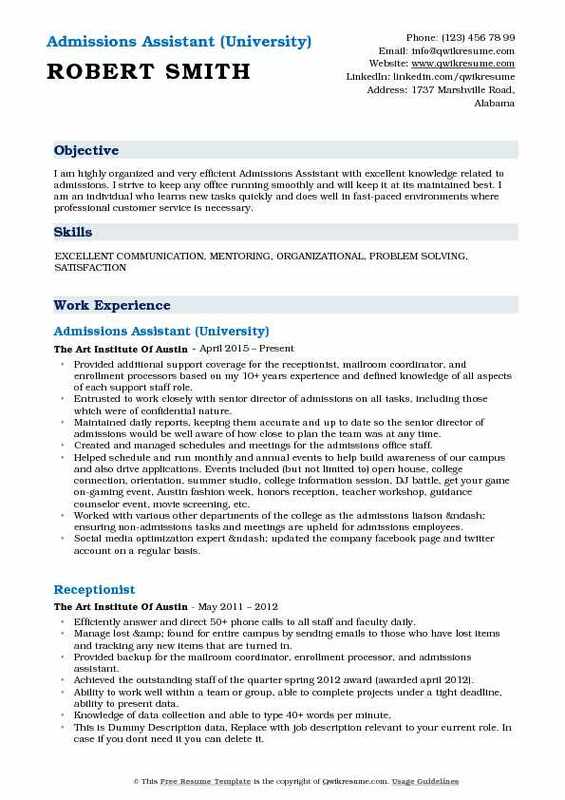 Summary : An accomplished business professional with broad-based experience in all aspects of office administration and customer service. A blend of business acumen with the willingness to take the required steps to achieve desired goals and meet new challenges. Adept at analyzing problems and identifying creative solutions. Self-motivated and focused, with the ability to work alone or as an integral part of a team. Responsible for providing administrative support and assistance for this 164-bed skilled nursing facility. Handled all administrative functions for new admissions: established resident files with all pertinent information and statistics; arranged for staff transport to patient room assignments. Provided assistance to medical records department: reviewed patient files for accuracy and completeness; distributed new resident charts to appropriate units; prepared copies of all required documentation for legal department. Coordinated schedule of appointments for personal services for all residents; documented and maintained records of payments for all services rendered. Monitored and maintained inventory of all office supplies and equipment; handled and distributed incoming correspondence. Furnished efficient response to all telephone inquiries and directed to appropriate department when necessary. Maintained a safe and secure environment for all residents; notified appropriate staff members of any unusual behavioral issues.